Neuromyelitis Optica or Extensively longitudinal transverse myelitis is a central nervous system disorder characterized by inflammation and demyelination of nerve of the eyes, i.e. optic nerve and spinal cord. Its other names are Devic's disease or Neuromyelitis Optica spectrum. This is a rare autoimmune disorder in which immune cells of the body attack optic nerve and spinal cord. It can happen after certain infections or can be associated with any other autoimmune disease. 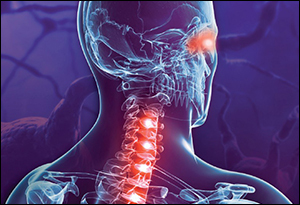 Neuromyelitis Optica can result in adverse conditions like blindness or paralysis. However, it is a reversible condition but its attack can result in severe and permanent damage. WHAT CAN BE THE SIGN AND SYMPTOMS OF NEUROMYELITIS OPTICA? WHAT ARE THE CAUSES OF NEUROMYELITIS OPTICA? Its exact cause is not known. It is not a genetically inherited disease but usually, people suffering from Neuromyelitis Optica have any other autoimmune disease like diabetes (type 1), psoriasis, rheumatoid, and vitiligo. Extensively longitudinal transverse myelitis is an autoimmune disease in which body's own immunity attack the healthy cells and destroy them resulting in abnormal functioning or loss of function of an organ. HOW CAN BE NEUROMYELITIS OPTICA DIAGNOSED? The doctor will examine for vision, thinking, speech, strength and reflexes, i.e. neurological examination. Lumbar puncture to test the levels of immune cells, antibodies and proteins. HOW CAN BE NEUROMYELITIS OPTICA TREATED? Conventional treatment for Neuromyelitis Optica usually aims at reversing the recent symptoms and preventing future attacks. Generally, steroids are used to treat inflammation and its associated symptoms and other drugs too. WHAT IS AYURVEDIC INTERPRETATION OF NEUROMYELITIS OPTICA? According to Ayurveda, any autoimmune disease is caused due to the intentional not accidental attack of immune cells on particular cells. This occurs because 'Ama' gets deposited and immune cells attack to get this Ama removed from it. But during this process, healthy cells to which Ama is deposited also gets killed resulting in autoimmune disease. 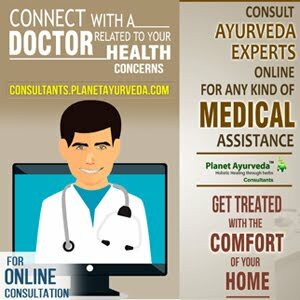 Planet Ayurveda offers best herbal remedies for the complete treatment of this disease. All the remedies are made from pure and authentic herbs. They are purely vegetarian and free from chemicals, preservatives or additives. These products do not have any side-effects and are completely safe to take. 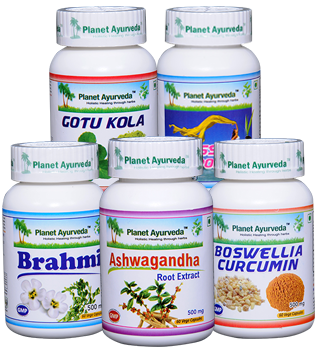 These are the pure herbal capsules made under strict Ayurvedic principles and consist of a wide variety of medicinal qualities. Inflammatory sign and symptoms can be treated efficiently by Boswellia Curcumin capsules. It relieves pain and swelling of the affected part. These capsules help in improving sensation in legs and arms and treat numbness. Pain in legs, arms, and head can be relieved by its proper consumption. The weakness of extremities can be treated by these capsules. It relieves stiffness of the neck and helps to gain control over bowel and bladder. Other conditions like osteoarthritis, cervical spondylitis, rheumatoid arthritis, ankylosing spondylitis, asthma, allergies, and chronic colitis can be treated effectively by regular intake of these capsules. DOSAGE- Take 1-2 capsules two times a day after meals. These are the single herb capsules composed of a standardized extract of Centella asiatica (Gotukola) herb. It is filled with wonderful medicinal effects. It improves memory and concentration which becomes impaired in Neuromyelitis Optica. These capsules prevent nervous exhaustion and help to treat diabetic neuropathy without causing any side effects even if taken for the long term. Stress and anxiety can be combat by Gotukola Capsules. Gotukola Capsules helps to regain vitality in the body. These capsules are rich in vitamin A, B, E, and K.
Herb named Bacopa monnieri (Brahmi) is used to make Ayurvedic Brahmi Capsules. It is packed with wonderful medicinal properties which help to treat various health ailments. Brahmi capsules are known as nerve tonic, it improves and facilitates the proper functioning of the nerves. It sharpens brain and improves memory if taken in the proper amount. These capsules help to relax the muscles and improve movements of legs and arms. Sleep is enhanced and the body is relaxed by its proper consumption. The sensation is improved and numbness is diminished when taken as prescribed by the physician. These capsules are made from a single herb named Withania somnifera (Ashwagandha). Ashwagandha capsules are enriched with amazing health benefits which help to treat many diseases and health ailments. These capsules reduce anxiety and stress and enhance memory. It possesses anti-inflammatory properties which help to treat inflammation and relieves its associated symptoms like pain, redness, and swelling. Ashwagandha Capsules helps to combat discomfort and enhances smooth body movements. Numbness is reduced and proper sensations are maintained by its regular consumption. These capsules boost up the immunity and ability of the body to fight against various infections and diseases is enhanced as well. It regulates the proper functioning of the immune system and prevents autoimmune diseases. It is a blend of three beneficial herbs, i.e. Ashwagandha (Withania somnifera), Tagar (Valeriana wallichii), and Brahmi (Bacopa monnieri). As its name implies it reduces the stress and anxiety in an effective manner without causing any side effects. It maintains the proper functioning of the nervous system. These capsules enhance physical and mental functioning. Stress Support Capsules prevent and treat loss of memory and Lack of concentration. It also helps to relieve hysteria.